The iPad has been quickly adopted by musicians for its ability to add computing power to a set up without all the complications of an actual computer. But while the iPad has done wonders for music keyboards and MIDI instruments, it's been more of a practice tool for guitar players. While iRig and Amplitude can produce a decent tone, you wouldn't bring it on stage. But with Line 6's AmpliFi FX100, guitarists finally have an accessory that makes the iPad shine in any situation. The idea is really very simple: leave the heavy lifting to the multi-effects processor and let the iPad do what it does best: provide great usability. The combination gives you Line 6's great sound along with a great touchscreen interface to shape the tone. The board itself is minimal, but it has enough to ensure it is stage-worthy. There are four-foot switches to change tones or switch banks, giving a guitarist the ease-of-use they are used to on stage. There's also a tap button for the metronome, a tuner, an expression pedal and the ability to change the tone via knobs on the device. But the AmpliFi FX100 isn't designed to be tweaked with a few knobs and an archaic screen on the device itself. When you need to modify your tone, you boot up the AmpliFi app on your iPad. The FX100 has over 200 amps, effects, and speaker cabinets, basically the same as the mid-range Line 6 multi-effects processors. The easy touch screen interface makes sculpting the perfect tone as easy as using actual stompboxes. Not sure where to start? The cloud-enabled AmpliFi FX100 can take a song on your iPad and find an appropriate guitar tone. The process is actually very simple: play a song within the AmpliFi app's music library section and the closest tone matches are displayed alongside the song. And because these tones are user-generated and uploaded to the cloud, the AmpliFi's tone database will actually grow as time goes along. A nice side effect to this process is the ability to use the AmpliFi's Bluetooth connection to the iPad to play music through the AmpliFi FX100. So if you have it hooked up to a nice set of studio monitors, you can essentially turn them into Bluetooth compatible speakers. And, of course, the AmpliFi FX100 comes with a guitar tuner built into the board. 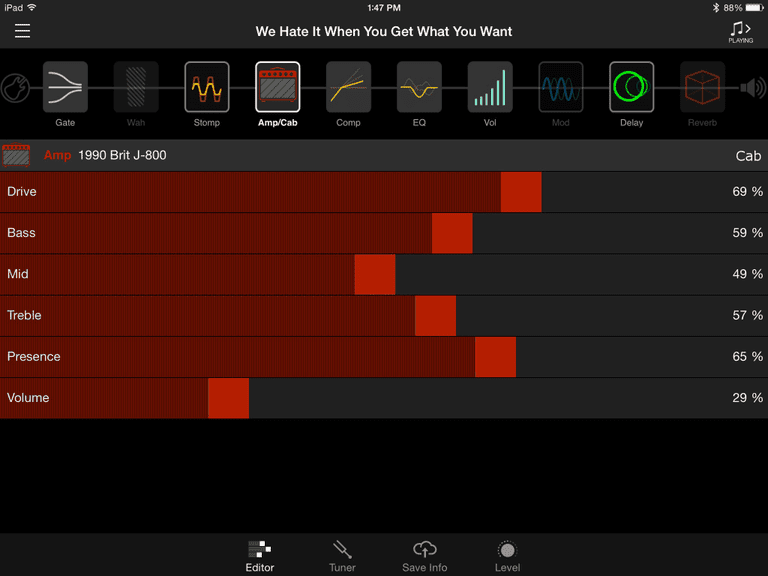 This is similar to most multi-effects processors, but the nice part about AmpliFi's solution is the ability to use the iPad's screen to help you tune your guitar. This is far preferable than getting a pain in your neck staring down at your board. There are a couple of things working against the AmpliFi FX100. First, it doesn't have the tone library of Line 6's upper-end multi-effects processors, so you won't get the same great sound as a POD HD500X or a Pro X. The FX100's sound isn't bad, but as mentioned above, it is definitely mid-range. Second, the FX100 doesn't come with a looper. For some, this won't be a big deal, but for others, it may be a deal breaker. But if you are looking for a great effects processor with an entry-level price, it's hard to beat the FX100.